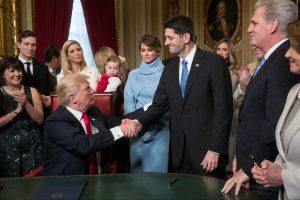 WASHINGTON — President Donald Trump quickly assumed the mantle of the White House and began setting up his new administration on Friday, signing a bill that allows retired Gen. James Mattis to serve as his defense secretary, as well as the nomination papers for his other Cabinet choices. The bill passed by Congress last week grants Mattis a one-time exception from federal law barring former U.S. service members who have been out of uniform for less than seven years from holding the top Pentagon job. The restriction is meant to preserve civilian control of the military. Mattis, 66, retired from the Marine Corps in 2013. While Trump participated in the rituals of the day that included the inaugural parade and balls, there were signs his new government was up and running. Federal websites and agencies immediately began reflecting the transfer of power, and WhiteHouse.gov was revamped for Trump’s policy priorities as pages about LGBT rights and the Obama administration’s climate change plan were eliminated.